Mourinho's Next Move: Is There A Club Out There For The Not-As-Special One? It's been a tumultuous season for Jose Mourinho. "Aren't they all?" you cry, and you've got a point. But since his dismissal from Manchester United in December, he's spent his time as you'd expect him to, touring assorted TV studios, offering his opinions on the game, telling amusing anecdotes from his career and generally making sure he stays in the public consciousness. Now he says he wants to return to management; his aim, apparently, is to secure a new job by the summer. He claims to have already turned down "three or four" jobs in his time away, too, with those mystery positions apparently not fitting his own specific criteria. So what job would be suitable for Mourinho? Is there a club that can satisfy his ego? Would he only consider one of the biggest teams, or might he be persuaded/forced to take a small "step down?" Perhaps more importantly: who would take him? Are there any big clubs out there who are prepared to deal with his scorched-earth approach and the aftermath that comes with it? Is there anyone out there who still thinks he's a guarantee of trophies? In short, where could Jose Mourinho go next? We run through the possibilities. A couple of weeks ago, this would have been a possibility. Mourinho seemingly still has the ear of Florentino Perez; despite striding away from a blazing Bernabeu in 2013 having made enemies left, right and centre, his name was linked with a return before Santi Solari's dismissal. Zinedine Zidane's reappointment ostensibly scuppered those rumours, but you never know: this is a club where logic goes to die. Mourinho is quite happy to go back to an old job, so what about Inter, the club with whom he won the treble in 2010? Luciano Spalletti has guided them to a respectable league position in 2018-19, but their spectacular failure in Europe -- Inter were dumped out of the Europa League by Eintracht Frankfurt -- could be damaging. Never a man afraid to take personal grudges into his professional life, this is a job Mourinho might take purely if they offer it to him ahead of Antonio Conte. Naturally, this depends on Massimiliano Allegri. If he decides that five years with Juventus is enough and leaves in the summer, Mourinho will be among the candidates to succeed him. However, even if Juve decide they can live with Mourinho's baggage, he's almost certainly the wrong type of manager for them. If Allegri goes, they will want a continuity candidate, rather than someone to kick the doors in and shake everything up. He's gone back once, so could he go back again? We'll keep this short: even if Maurizio Sarri is shoved through the oft-used Chelsea trapdoor, the answer is no. Given that PSG stuck with Unai Emery after they came second in a one-horse race, losing the Ligue 1 title to Monaco in 2017, it would be surprising if they sacked Thomas Tuchel. But maybe after more European disappointments, they'll consider the prospect of a double Champions League winner -- even if the last one was nine years ago -- more appealing. Don't underestimate PSG's desire to win in Europe; that said, could Mourinho beat Man United? This is only really worth mentioning because they're one of the few remaining superclubs yet to experience The Special One, but it feels very unlikely. 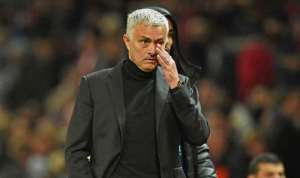 Bayern probably won't want Mourinho and Mourinho probably won't want Bayern, if only because of his assorted disparaging comments about the club and Pep Guardiola in the past. Now we start stepping below the elite, the level of club that Mourinho regards as befitting his status. But might he take a rebuilding project with relatively low-pressure appeal? He's openly said he wants a club with no internal conflicts, and with his agent Jorge Mendes's influence at Monaco, he's unlikely to have too much pushback there. This will go against Mourinho's career moves to date, but of all the options, it's probably the most interesting. See above. Although a combination of Nuno Espirito Santo doing a very nice job at Molineux and Mourinho probably thinking this is all a little beneath him, it's less likely. An era seems to be coming to an end at Atletico Madrid. Might Diego Simeone finally decide he needs a new challenge? If so, it will probably require someone with a significant ego to succeed him. Anyone know a coach who fits that description? Even if he generally bulldozes his way through most jobs, Mourinho isn't a man entirely devoid of sentiment: that was at least part of the reason for his return to Chelsea. So might he go back to his very first job in management? It would probably be more of a surprise if they dispensed with Bruno Lage, currently doing superbly well at home and in Europe, but this is a vague possibility. Mourinho said recently he isn't yet ready for international management but has stated in the past that the Portugal national team job is something he wants someday. Fernando Santos can't go on forever; if they win the Nations League this summer on home soil, could it be a good time for him to bow out? This one does require quite a few things to change, though. All of this is based on situations as they stand now, but these things can change rapidly. Despite his stated aim of having another job by June, at the moment the most likely scenario is that he continues his tour of TV studios until something changes or someone panics at one of Europe's giants. He can then arrive to clean house with relatively low expectations.